Avery Customizable TOC Ready Index Plastic Multicolor Dividers, 10-Tab, Letter - Customize your documents with the durable translucent Table of Contents dividers. 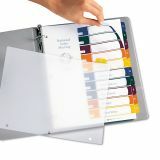 Dividers have a modern design for professional-looking documents that you can use to organize your design quickly and easily. 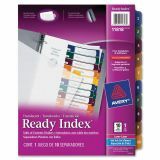 Use with laser or inkjet printers. 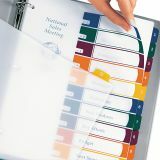 Dividers print in portrait format. 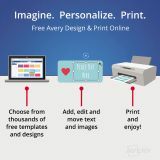 Print the section titles onto a plain sheet of paper and then three-hole punch the contents page. 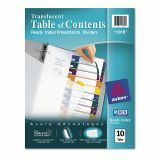 Place the sheet behind the translucent Table of Contents sheet. To update Table of Contents, just print new section titles onto another sheet of paper. Customize the Table of Contents page by adding graphics or a company logo. These dividers will not lift print. 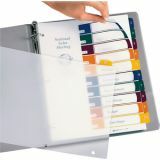 Use with standard three-ring binders.